Just a quick note on how we can benefit from the current economic environment. I mentioned in a previous post about now is a good time to lock in the lowest mortgage rates possible. It appears that even with the Federal Reserve buying US debt that rates are starting to move higher. Rates are still at or near all time lows. For those of us with a mortgage this is a good time to take advantage of this gift horse that the money masters have tossed our way. I don't believe that all this artificial manipulation will save the current economic system, but you and I can benefit from these low rates. I just closed on my home refi loan over the weekend. We managed to lock in a rate of 4% fixed rate for 30 years. Talk about crazy low rates, but I am thrilled. It gets our house payments down to those at or below the cost of an apartment in the local area. So this is a huge deal in my mind. It reduces our monthly cost(improves our cash burn rate), it makes our home very competitive in the rental market should we need to rent out the home, and gets us locked in at very low rates. So it is a win all the way around. The down side with refinancing is the cost of the refi itself. You end up paying lender fees, closing costs, inspections, and regulatory fees. So it doesn't come cheap. So weigh your own personal situation to determine if it makes sense to refinance in your case. If your in the market to refinance there are many mortgage search engines out there. The one I used with this refi was bankrate.com. I looked for their lowest rates, fees, charges, points and went with that lender which was offering the best rates for my area. So don't look a gift horse in the mouth. If you have been thinking about refinancing your home now might be a great time to take advantage of the low rates. Nobody knows how long they can artificially hold these rates down like this so I would say don't miss your opportunity if it is the right thing to do for your own personal situation. Well just a real quick update on the Lowes storage shelves. I ran over to Lowes today to pickup those storage shelves I told you about yesterday. I arrived at the Lowes that reportedly had lots of them in stock. I walked into the store and they had a prominent display with the shelves in the main aisle, but the shelves were marked $76 and some change. Needless to say I wasn't happy. I went back to the aisle that has the storage shelves on the normal display and the price was the same there as well. I went looking for a sales associate to ask them to check the price. I had already looked it up on the internet and had confirmed the price was suppose to be $49. I found an associate and I informed her of my problem. She went to go look it up. She came back a few minutes later and informed me that the price was in fact $49. So I was able to confirm the price is actually $49, but it is not marked that way in the store. So if your in the market for some shelves check these out. They are a great deal for the money. I snagged a few of them and got them home. I assembled a couple of them today and started shuffling boxes and items around the garage onto the shelves and have started to make a dent in the mess. I have boxes and stuff up to my eyeballs right now and these shelves are going to be a big help. Hopefully I will get time after work tomorrow to move some more stuff around and assemble the last shelf and free up some more space. I will have to start going through boxes next and start tossing anything that I cannot find a home for. There is just no room in a small place to be a pack rat. You have to do a major house cleaning a couple of times a year to get rid of excess stuff and junk just to keep things functional and usable. This is a pretty decently done video on the financial crisis as it has unfolded since the year 2000 and covers some of the major factors in how this is now setup for a global meltdown. The problems in Ireland will in fact cascade to Spain and Portugal. The massive stimulus, bailouts, and quantitative easing by the central banks has primed the pump for problems on a massive scale. Of course there is a lot more meat they could have put into this video showing the financial insanity and that the numbers just don't add up. I recommend taking the Crash Course by Chris Martenson to get a better understanding of the bubble economy and the coming corrections. Just a quick update for the followers of the Be Prepared Channel. Today I was over at Costco and saw a large display for Shelf Reliance. These folks have been featured on several podcasts and other survivalist/prepper forums, web sites, and stores. Today I got to see them up close. 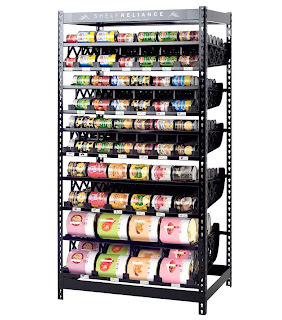 What Shelf Reliance is in a nutshell is a shelving system that allows you to rotate your canned goods for food storage. You put your newest purchased items in the top and they naturally rotate to the bottom as you use items from your shelf system. This way your always using the oldest canned goods first and ensures rotation of these items. Remember our food plan is about eating what you store and storing what you eat. Costco had a variety of models on display and the limited time sale price was frankly unbeatable. So I had to splurge and pickup one of these larger units and a couple of smaller can rotation units for the cupboard. These units routinely sell for $450 at normal prices. I see they have sale on their web site for $321, but if you run over to your local Costco they have a sale from Dec 4th - 12th at my local Costco for $269 for the 72" Harvest unit like the one seen here. They had a variety of sizes from smaller cupboard size to larger pantry sizes, stackable units, and a couple of the larger units. 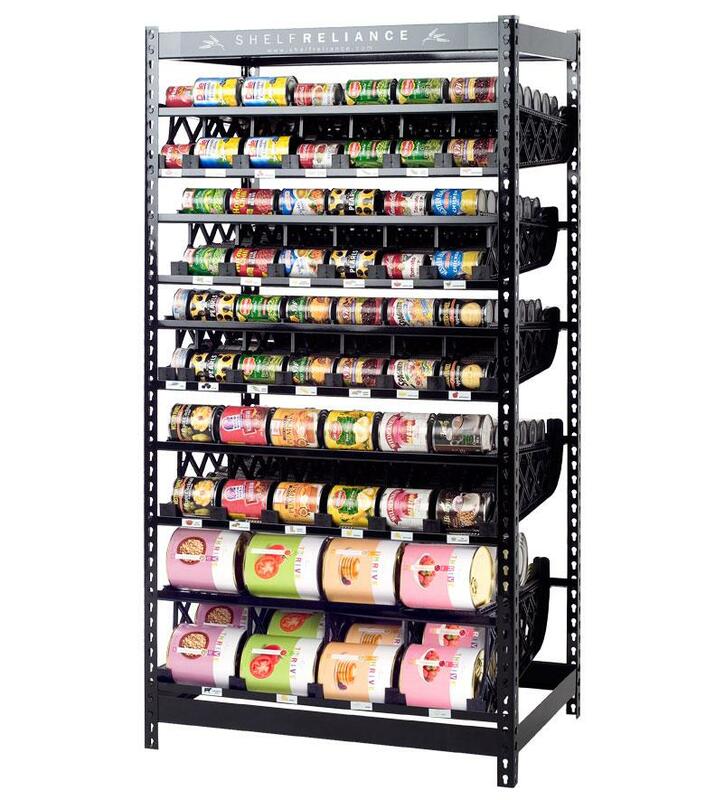 So do yourself a favor if you have been thinking about one of these units for can goods storage and rotation now is the time to take advantage of this sale. The products were in stock at the store and no shipping charges or any of that nonsense. Now for the second deal on storage shelving was brought to my attention by the Utah Preppers blog. Lowes has a sale on some heavy duty industrial shelves. I own some of these already, but I just happen to be in the market to expand my shelving to deal with all of my prepping supplies and other storage needs in my very very limited amount of space I have in my home. So this looks like a godsend at just the exactly perfect timing for me. I thought I should share this deal with you as well. Lowes has these shelves on sale for $49 each. When I bought mine at Lowes a few years ago they were like $120 each. Utah Preppers mentions that Sam's club has them on sale for $72 and that Lowe's current every day price is $99. I have not been over to Sam's Club in a while so I don't know if that is the case here locally. Since Lowe's isn't far away, and the price is a LOT less than that reported at Sam's I think I will be running over to Lowes tomorrow to get the rest of my shelving I needed to finish my garage and shed storage needs. Here is the link to Lowe's. You might want to plug in your zipcode and see if these are on sale in your area. 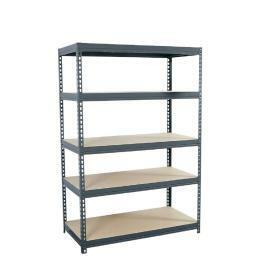 Frankly the price is hard to beat and these shelves truly are heavy duty industrial strength shelves. I give them 2 thumbs up. Well that is my quick update. We managed to get most of our stuff packed out of Nebraska and returned to Colorado. Now the tough part is trying to jam two households of stuff into one very small house with no basement or room for storage. We are up to our neck in boxes and stuff we have had in storage for the last few years. We have been bouncing around the country following jobs so much of our stuff has been in storage boxes which means we ended up over time buying other things we needed only to now end up with duplicate items between what we had in boxes and what we were using on a daily basis. It really is crazy stuff. So with all this stuff and my prepping supplies taking up precious space I am filtering through boxes and trying to find a place to put things. This is my reason for looking at storage shelves. The funny thing is I was just at Costco pricing the Whalen storage shelves today when I stumbled on the Shelf Reliance food storage system stuff. I was surprised, and very thankful for such a sale at just the time I am looking to get a better handle on my food storage plan. With very little room in this house organization is key to getting a handle on what you have, what you need, and developing a game plan for how to tackle it. Then this evening I noticed the post on Utah Preppers about the storage shelves which I already own being on sale for $49 a piece and this is just too good to be true. God does answer prayers and this appears to be a gift that couldn't have come at a better time. We are very thankful!